What makes a group of people want to work together as a team? What makes a team want to do their very best work? When people feel safe, supported, and free to make a valuable contribution that will be recognized, they consistently perform at their best. In this article we explore how to build the emotional intelligence competencies necessary to create these conditions. When the emotional environment is rich and transparent, teams can trust enough to take risks and that promotes more complete and creative decision making. Desired team competencies include trusting, risk taking, communicating, conflict resolution and being respectful and productive. These result when an organization intentionally understands these competency domains and develops the environment that elicits the motivation to fully participate and the emotional intelligence skills to support the competencies. 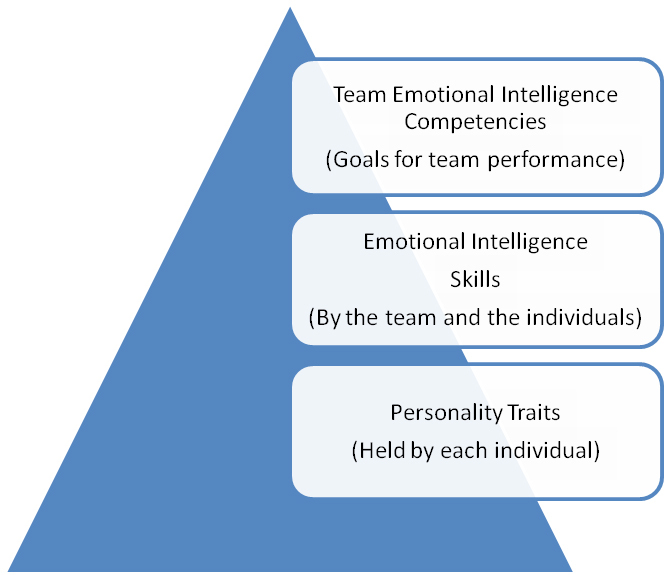 While different types of competencies are needed by teams, including technical expertise, we are focusing on Emotional Intelligence (“EI”) Competencies for this article. Competencies are the big picture statement of what is needed to be successful in a job. This is accomplished in part by the application of emotional intelligence skills, which can be independently measured and grown. EI skills are needed by the team as a whole, and can be measured by the TESI® (Team Emotional & Social Intelligence Survey®) and by each individual and can be measured by the EQi®. These skills are related to but different from individual personality traits, such as measured by the MBTI® or Emergenetics®. The following chart shows the progression we work with in understanding and developing team EI Competencies. Team Emotional Intelligence Competencies are implemented through a complement of skills, attitudes, behaviors and information. hen we are talking about team competencies, we are speaking of the skills or abilities needed to perform the specific tasks or functions assigned to the team. Accomplishing the competency is based upon their attitudes and behaviors as well as having the skills and knowledge needed. 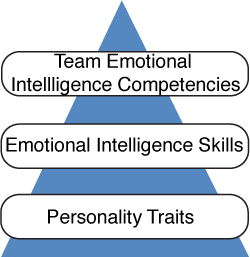 To be successful, teams need strength in emotional intelligence competencies such as trusting, risk taking, communicating, conflict resolution and being respectful and productive.We consider each of these areas as their own competency domain, and each competency domain is implemented through a complement of skills, attitudes, behaviors and information that are called for in a particular setting. Teams need technical skills. For example, a team may need a competency in working with metal if they are building bridges, but to actually get the bridge designed, funded and built so it’s structurally sound and aesthetically pleasing requires many competencies from the technical ones to others that are based in how intelligently the team works with their emotional and social information. Some of that information will be new, such as occurs when the CEO of a big bridge project walks into a team meeting and congratulates the team for being ahead of schedule and under budget. Most of the emotional and social information that informs team decisions will come from past experiences. When we reference past experiences as a part of our thinking, they always come with emotional tags. We can’t avoid it, there is no such thing as making a decision without using our emotions. Our choice is whether that emotional information is used well. That is why teams and their individual members need to use their emotional and social intelligence. To exercise conflict resolution skills well, teams need to create the capacity to embrace divergent thinking, engage creatively and then coalesce around a common decision. The competency of a team resolving conflict is implemented by a collection of team and individual skills. At the team level they need team identity, emotional awareness, the ability to communicate well, stress tolerance skills, and a positive mood. 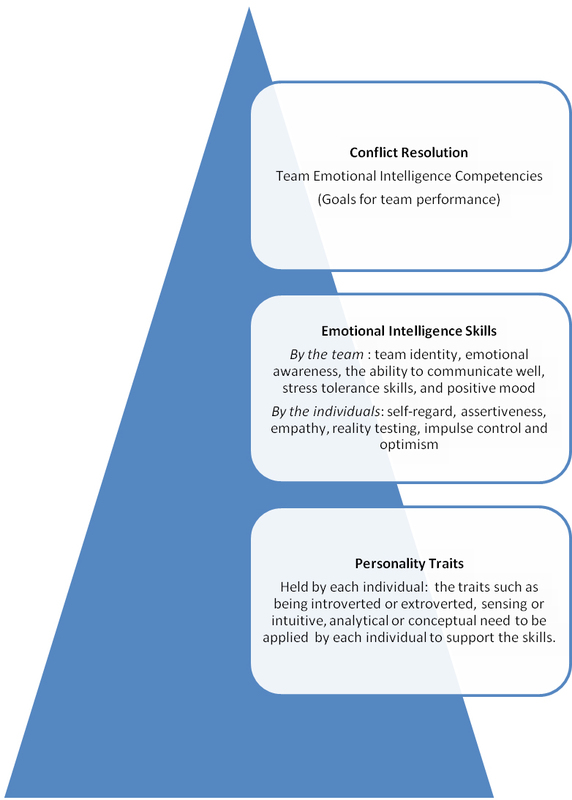 Individuals on the team also need individual emotional intelligence skills in self regard, assertiveness, empathy, reality testing, impulse control and optimism. While every team needs all of these skills to resolve conflict, different teams will need a different balance of those skills. Depending on the culture of the organization that houses the team and the socio-political environment in which they operate there will be different emphasis on how conflict is addressed. For people who serve on many teams, success requires the ability to dial those skills up and down based on the specific situation. 1) Identify that they value teams being able to resolve conflict well resulting in establishing conflict resolution skills as a team competency. 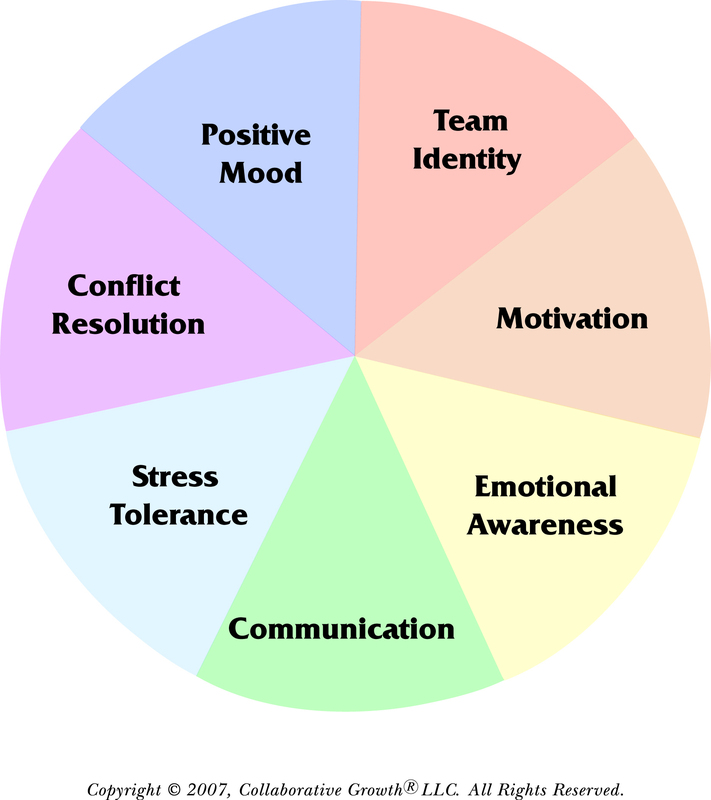 2) Identify the emotional intelligence skills at the team and individual levels needed to support success in resolving conflict. (Remember there are other factors at play in addition to EI skills, such as sufficient information and resources and take those into account as appropriate.) The EI skills needed are: By the team: team identity, emotional awareness, the ability to communicate well, stress tolerance skills, and positive mood. By the individuals: self-regard, assertiveness, empathy, reality testing, impulse control and optimism. Together these skills need to support the ability to engage in divergent thinking and then move to convergent thinking where all rally around the final decision. 3) Measure the current strengths and challenges for the team with the TESI and for the individuals with the EQi or EQ 360 and set strategic goals for improvement. 4) Give all team members their individual MBTI or Emergenetics profiles and discuss how these trait or personality preferences affect team engagement. Understanding this will help define the best learning approaches as skills are being developed. The Collaborative Growth team model provides a process for successfully implementing team EI competencies. The seven scales measured in the outer circle are all competencies, the implementation of any one supports successful implementation of the others, which is why the model is presented in a circle. However, some scales will be more relevant to particular goals, such as demonstrated in Figure 2. The middle circle shows the four desired results of team engagement, such as trusting one another, are more complex competencies that result from developing the first seven scales. 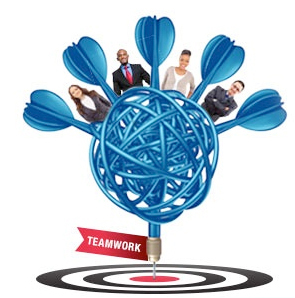 The inner circle, or bull’s eye, demonstrates the long term benefits teams and their organizations gain when these competencies are implemented. The TESI is a team 360 which measures the team members’ assessment of how well they are implementing the seven scales in the outer circle. It can be used to measure team progress through taking it before development begins and again as the strategies are being implemented. When developing your teams, you’ll have much more success when you strategically use a multi-dimensional approach including competencies, specific skill development and incorporating awareness of the personality traits of team members.